If you are wondering how to organize mail in your office, one of the best things you can invest in is a mail sorter. And with several different types of mail sorters available, it’s easy to find the one that will best suit your needs! A great floor saving unit is a stand-alone mail sorter. This large sorter stands by itself just like a typical shelving unit. You can choose from many different types of stand-alone mail sorters. For example some units have a retractable work surface for looking through mail and literature. You can use the surface and then push it back in when you don’t need it anymore. The shelves on the stand-alone mail sorters come in three different sizes: standard, legal, and oversize. Each shelf is adjustable on 1 inch increments with full support on both sides. You can also easily adjust the shelf even if it’s fully loaded with papers. If you are looking for a way to conveniently pass mail from one area to another, then what you need is a pass thru mail sorter. These dual sided open back sorters allow you to place your mail in one side of the sorter and retrieve it from the other side of the sorter. For example, you can mount a pass thru sorter in the wall of your mailroom to allow mailroom staff to sort mail into slots from inside the mailroom and employees to retrieve mail from outside the mailroom. This saves time distributing mail to various offices by mailroom personnel. Doors can be added to the pass thru sorters for additional security if required. trays slide in and out on tracks making opening heights between shelves easy to adjust. full length name labels that are easy to change. no sharp edges to guard fast moving hands when sorting mail. comes fully assembled – just open the carton, set the mail sorter in place, and slide in the sorter shelves to use. a large variety of sorter color finishes to match any office décor. 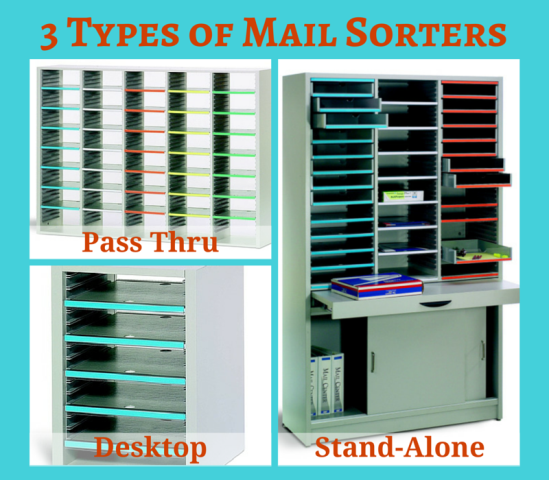 These are just three types of mail sorters you can find online at StoreMoreStore. And if you have any questions or want some assistance, please give us a call at 1-855-786-7667.